Whether clean or dirty, they still look good. I got them for performance, not cosmetic, reasons. 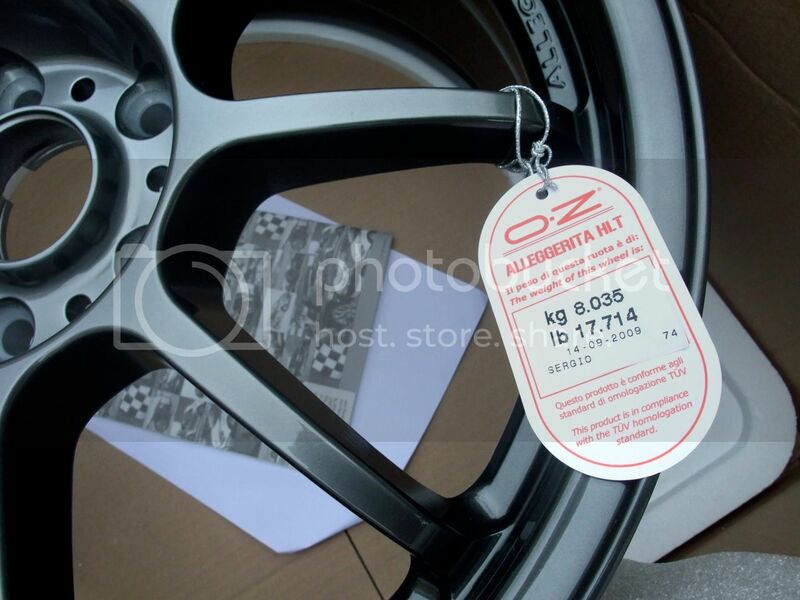 The oem Monza 18's weigh 12kg (without tyres). You'll be able to take off soon! 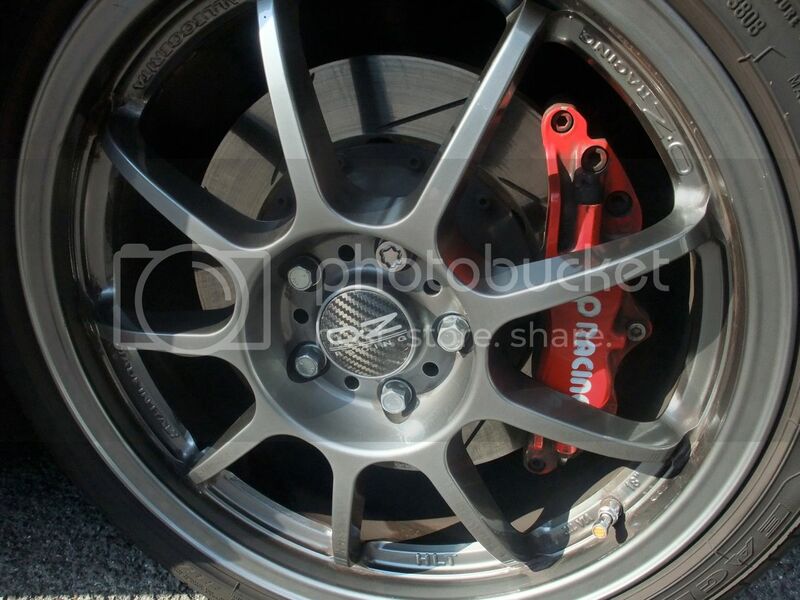 It's the colour Robin - my Superleggeras are the same and don't show the brake dust. That should have read "Clean or dirty, they look the same." ....Yes, I think Titanium is OZ's stock colour - Very practical it is too. Like you, I'd rather be driving than detailing although I did recently clay and Zaino my car for winter for protection and to make it easier to clean when I do. I haven't seen any Superleggera's on Golfs yet. Looks like a full-on track toy now Robin. I like the wheel design but at first glance I thought they were 17"s. I'm sure they must be 18's and it's just the way the spokes join to the inner part of the rim. ....She certainly looks more track-friendly and purposeful but I wouldn't go as far as saying "track toy". I feel that I've achieved a nice balance between 'comfort' and performance. The lighter weight of the wheels really does tangibly add to my other suspension mods and improve the handling still further. 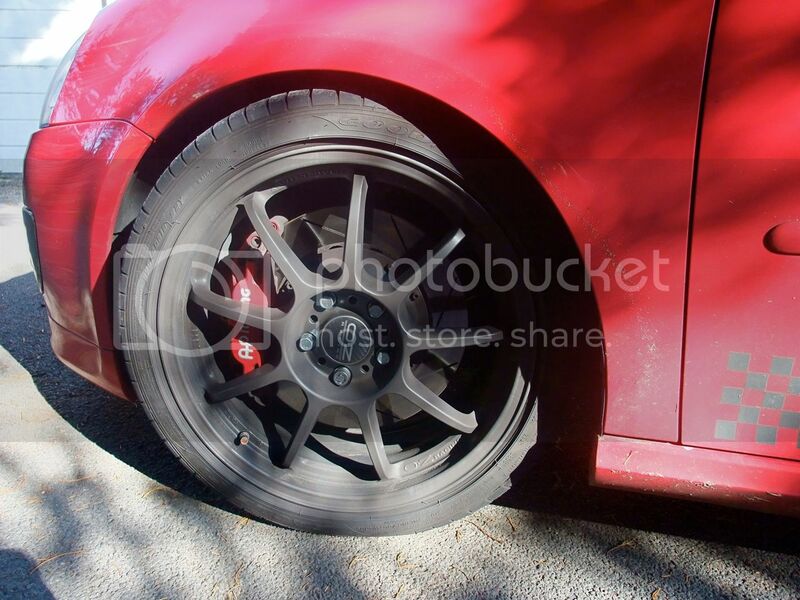 OZ make 17" versions of the Alleggerita and it's currently the lightest wheel you can get which is TUV approved. You're right, the spokes to rim junction makes the wheel look smaller but this isn't an issue for me - I just love the improved feedback and feel. I was lucky enough to do a trackday there very recently. I plan to revisit and it's less than a couple of hours from Nurburgring. 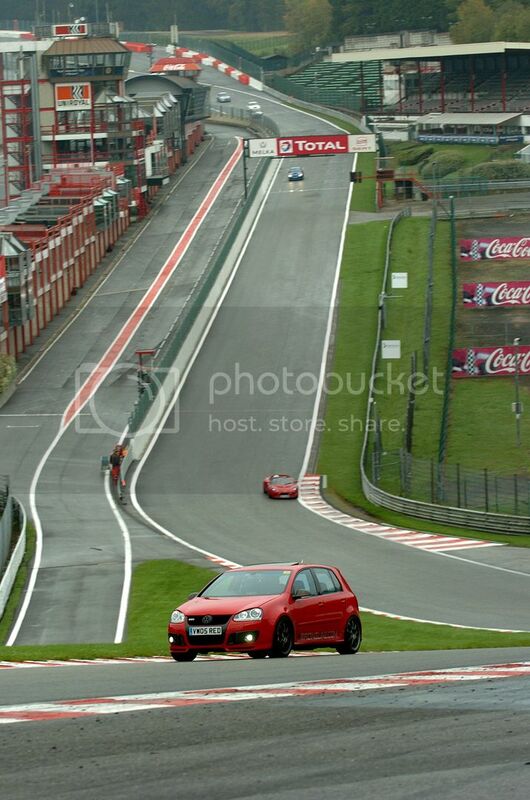 coming up the hill to Eau Rouge as well I think? Cool, would love to take a trip over there, but need something a little more exciting than the Q7!.. 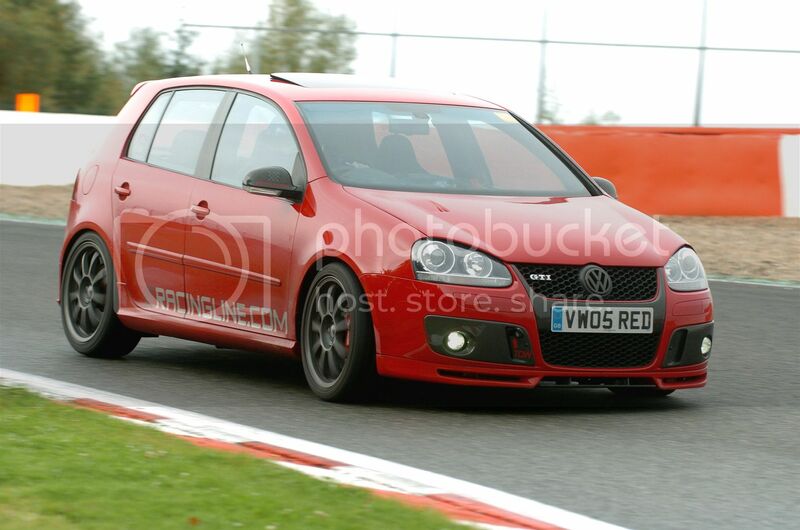 ....Special days, only bookable like many trackdays, Dave. The guy I went to The Ring with was able to arrange it. Lots of English cars - All sorts. I ought to write and post a 'report'. ....I don't like black or very dark wheels on red cars or most other colour cars either, Jon. The OZ Titanium colour is the best of all worlds - Can look very dark, or anthracite, or stainless steel. I felt that the cheaper (half the price of OZ's) Team Dynamics 1.2's wouldn't suit my red 5-door car so well and they don't have that style which the Italians are so good at. The TD's represent much better value-for-money but it depends what you want. Just sharing another pic - They do look slightly different in different light but always rather 'purposeful'. Robin, you're aware that your disk is on the wrong way round? The vanes should pointing the other way. Too late for this set of disks and pads, but you should swap them over next time. This has been said before but RR has checked with AP and they have confirmed that it's mounted correctly. Maybe he should talk to BMW, Audi Racing and probably VW Racing then. Still, it's not my money. petsy is right. AP Racing fitted my brake kit themselves up at Coventry - It isn't the wrong way around - The internal vanes are correctly orientated and you're just seeing the brake dust dissipation grooves. Im going to have to stop looking at threads of yours im really starting to get the tingling to modify. 'm really starting to get the tingling to modify. ....Ah yes, but Geoff has seen what happens when you only put just one foot on that slippery slope of modding! Very true i have i had hoped i had grown out of it. 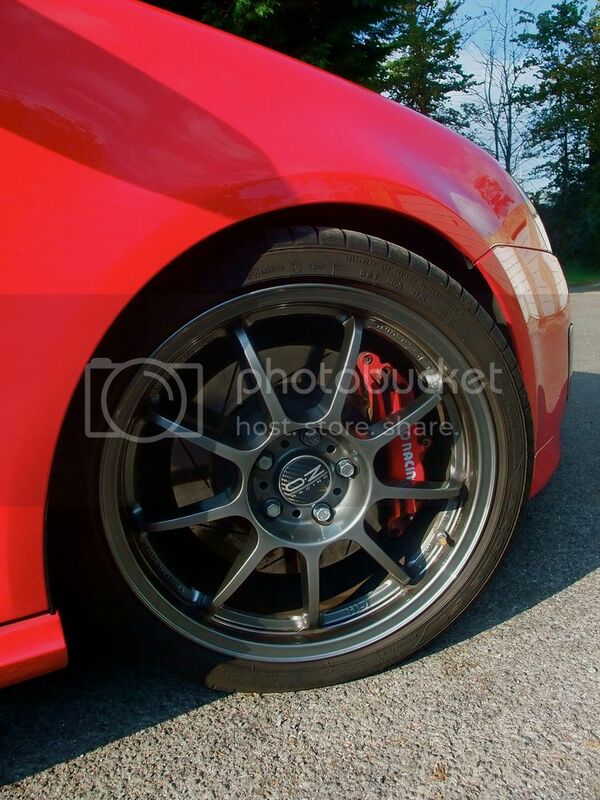 I just keep thinking, well i could change the wheels, then think, well stage one is not that bad now is it. The audio needs sorting, and it keeps going from there and i don't even have this car yet!! !.